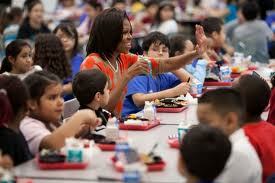 The First Lady’s School Lunches Stink, so What Now? The First Lady is dead wrong about the national school lunch guidelines — the low-fat, low-calorie meals she proposes are unhealthy and inhuman. But the correct reply is not that she should suggest more satisfying food, as some conservatives contend. The correct reply is: what the heck is the federal government doing in the school lunch business? I said this on my Facebook page the other day and a member of that page one-upped me: “What the heck is the federal government doing in the school business?” Indeed. For years, the USDA has favored a distorted food pyramid and horrible school lunch programs that seemed more geared toward enriching government contractors and subsidizing the big agricultural lobbies than feeding students affordable, tasty, and healthful meals. What a surprise that the major food groups were so well represented by the corn lobby, the meat lobby, and the dairy lobby. And anyone who actually ate any of this food in the last twenty years knows that it was only one step above the gruel fed in America’s prisons. I’ll never forget the nightmarish “turkey cubes,” floating in gelatinous “gravy,” that were inflicted upon the student body every Thanksgiving week. On a good day, students were treated with chicken nuggets or a quadrilateral of pizza-like substance. On most days, the schools served up something more resembling Soylent Green.